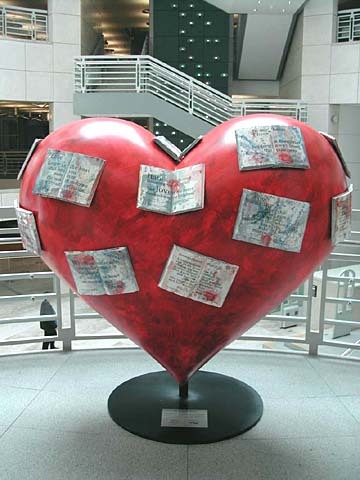 POEMS FROM THE HEART is one of the 130 large sculptural hearts created by artists to support the San Francisco General Hospital. 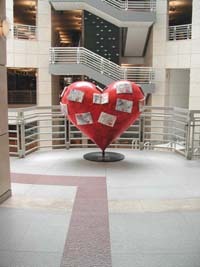 The heart sculpture by Charles Hobson is located on the mezzanine of the main entrance of the San Francisco Public Library, 100 Larkin Street, San Francisco. 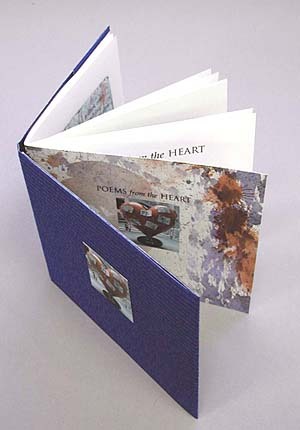 POEMS FROM THE HEART is a hand-made artist's book picturing the heart sculpture by Charles Hobson which contains eighteen poems by children about love and the heart. Each book has been hand sewn into a painted cover and mounted in a folded corrugated folder. 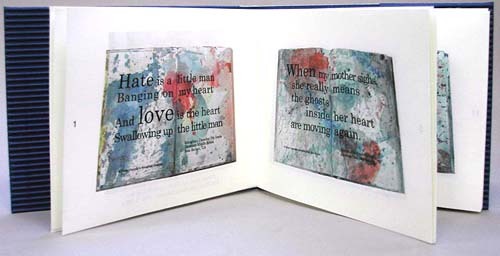 It contains digital pigment prints from an Epson 2200 printer which portray the printed books and poems used on the heart sculpture. Sales of the book, Poems from the Heart, benefit the San Francisco General Hospital through its "Hearts in San Francisco" project. The poems have been used with the kind permission of the poets which have been made available through the California Poets in the Schools. 24 Pages. 4 1/4 x 5 1/2 inches. "A year or two ago a poet friend of mine, Kathy Evans, sent me the following poem by a young poet whom she had taught in the poet in the schools program." "I put the poem up on my studio wall and looked at it frequently. When I got a call asking if I would do a heart for the Hearts In San Francisco project for the SF General Hospital, I was inspired by Meaghan's poem. I saw a heart covered with books containing poems by kids about the heart and love. Kathy and Mary Vradelis, Executive Director of California Poets in the Schools, helped me select additional poems. The most amazing part of the project for me was seeing how all of the eighteen poems when mounted on the heart interact with one another to draw a picture larger than any one poem and make the whole heart luminous in a special way."